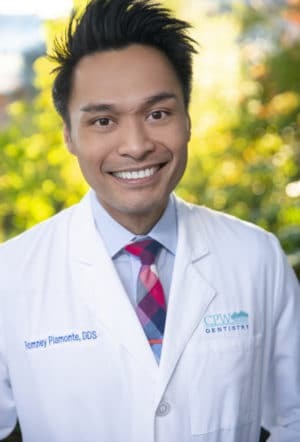 Dr. Romney Piamonte’s passion for dentistry came at an early age when he experienced first-hand how a beautiful, healthy smile from expert dental care empowered his confidence. Dr. Piamonte received his Bachelors in Chemistry from UCLA, followed by his Doctorate in Dental Surgery from NYU College of Dentistry where he was inducted into the Omicron Kappa Upsilon National Honor Society. He completed his General Practice Residency at Mount Sinai Hospital where he honed his proficiencies in restorations, cosmetic dentistry, Invisalign and root canal therapy. In his spare time, Dr. Piamonte enjoys working out, which counterbalances his joy of cooking and eating Julia Child recipes. Other passions include what some may consider a slight obsession with his dachshund, Hans. Before becoming a dentist, Dr. Piamonte was a professional musical theater actor and still continues to perform with friends for fun. A: I want them to feel comfortable and empowered. I want them to be active participants in making decisions on their treatment. A: Drink lots of water, especially after eating. Also, there really isn’t a shortcut to brushing and flossing, but if you do both often enough, it should start feeling as routine as pressing snooze in the morning. A: I enjoy tap dancing!